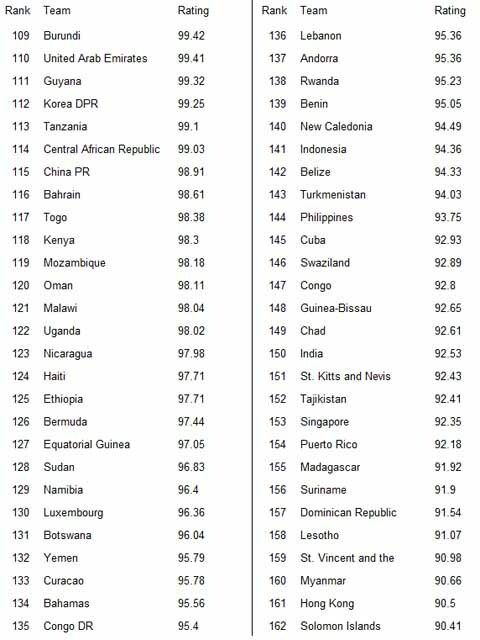 A rise of 33 places see United Arab Emirates climb into 110th position. There were also big gains for Burundi +22, Mozambique +22 and Curacao +25. Guyana, Congo DR, Lebanon, and Indonisia had significant gains, whilst Lesotho +10 and Hong Kong +22 enter this group. Malawi, Uganda, Sudan, Andorra, St Kitts and Nevis, Tajikistan and Suriname all had significant falls since last month. Korea DPR -10, Central African Republic -10, China PR -23, Bahrain -30, Nicaragua -16 and Luxembourg -27 all fell back into this group this month.